Gone are the days when companies used to send SMS with old, unstructured databases. All thanks to the new Bulk SMS service providers who uses advanced database tools to target companies loyal and potential customers only. But with so many choices of bulk SMS service provider sometimes it can become difficult to choose the Best bulk SMS provider. Although many people will give you various points to consider before selecting any one bulk SMS service provider but only very few will tell you to focus on their technical advantages too. 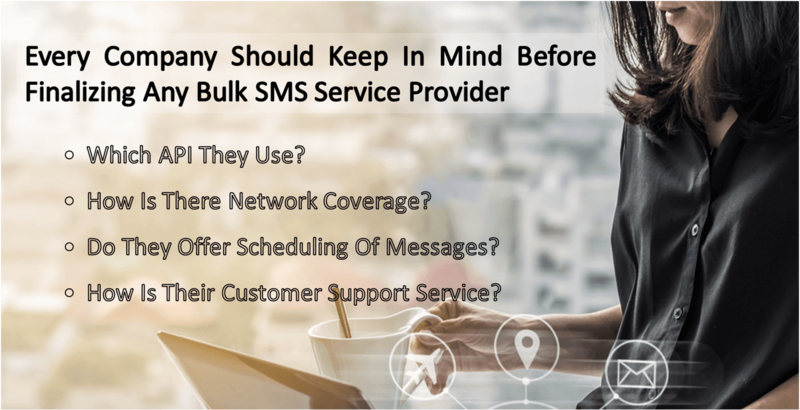 So, here we are listing some of the technical considerations that every company should keep in mind before finalizing any bulk SMS service provider. • Which API They Use? Every bulk SMS service provider use one or another API for delivering the services to their clients and as their client it is very important to know that on which API they actually work. This will help you understand their functioning and quality of services in better way. • How Is There Network Coverage? No matter how good their conversion rate is or how good they is their message open rate but they need to have an awesome network coverage without any sort of geographical constraints. However, there is always an exception in this case but still prefer one which has vast and easy coverage over the one which has very limited network and geographical coverage. • Do They Offer Scheduling Of Messages? Although the SMS service provider might offer you many attractive features like sending pictures, images, ;links, call-to-action buttons etc to make your message look more interesting but above this all it is very important to check that whether they offer scheduling of messages or not. Right message at wrong time can adversely affect your reputation in the market. So, make sure they offer the service of scheduling. • How Is Their Customer Support Service? A good bulk SMS service provider will always have a supportive, 24*7, knowledgeable, skilled and trained customer support staffs who can help their clients resolve any kind of issue at any given point of time. This is one another way to find that will it be able to provide reliable and trustable services or not.